I’ve never loved Bose headphones. Out of the box, they always felt a bit flimsy, and on my head, the audio quality seemed subpar for the price. At least that’s what I thought before I tried the new QuietComfort 35 Wireless cans. 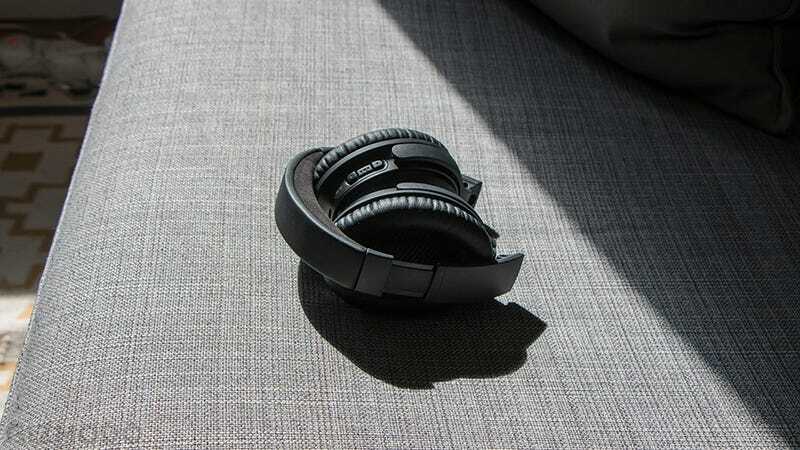 The noise cancellation is peerless, and the sound is terrific — for the most part. This shouldn’t be a huge surprise. The QuietComforts have long been lauded as Bose’s best noise cancelling headphones, and the fact that the company is finally offering a wireless version makes great sense in the marketplace. Taking the wire off a great set of headphones introduces new challenges, however. In my experience, dependably great audio companies like Sennheiser have struggled with connectivity issues. Check out the padded microsuede bit on top of the headband. It’s very comfortable! The new £290 QC35s do not. The headset can connect to two devices at once, and switching between the two is seamless. Interference isn’t an issue, either. If I were blindfolded, I’d think these headphones were hardwired at all times. But instead, you get an impressive 20 hours of battery life and the utter freedom of not tangling yourself up in a cable. The QC35s live up to their name, too. They’re comfortable! And oh my God are they quiet. Bose loves to brag about inventing noise cancelling technology for Space Shuttle astronauts years before any other headphone company was considering it. Whether or not that history matters to the average consumers is up for debate, but I do believe there’s a reason you see so many people on planes wearing Bose noise cancelling headphones. Maybe it’s marketing, but after spending a week with the QC35s, I actually believe it’s because Bose’s noise cancellation really is better than most. I did not get to wear the QC35s on an aeroplane. I do live in a very loud city, in an flat with a loud air conditioner, and work in an office where bloggers have been known to shout. Wearing the QC35s, I barely noticed any of this noise. All I heard in the streets, next to my beastly AC, and beside my noisy co-workers was my daily soundtrack. The headphones were silent enough that my boss had to slap me on the shoulder from time-to-time because I couldn’t hear anything over my music. I haven’t reached this level of quiet bliss with any other noise cancelling headphones I’ve tried, with the important exception of the Parrot Ziks. The large ear cups have little vents in them so your ears don’t sweat too much. In fact, it’s easy to forget you’re wearing the QC35s. You don’t spend hundreds of pounds on a pair of headphones just for noise cancellation. You also want to listen to music, and you want those headphones to sound great. (As they should at this price point.) Here’s where the QC35s don’t quite keep up, though the price-to-fidelity equation is probably fair. The Sennheiser Momentum Wireless headphones sound simply incredible, but they also cost around the £300 mark. The JBL Everest 700s sound absolutely decent and cost £170 (or £250 if you want noise cancellation). At £289, the QC35s sound fantastic with a few drawbacks. The headphones feature very bright — perhaps too bright — sound at higher frequencies. The mids are just slightly muddy, and bass lovers will be disappointed with the lack of thump. All that said, the tuning isn’t bad. It shines with most genres of music. I loved the brilliance I heard when listening to bluegrass, like Shady Grove by Kentucky Thunder, although cheesy disco like Stayin’ Alive by the BeeGees sounded a bit shrill. The vocals in Juicy by Notorious B.I.G. were crystal clear, but I wanted more bass on Drop It Like It’s Hot by Snoop Dogg. Every Radiohead song I listened to sounded incredible, as did my favorite Dolly Parton songs. What frustrated me about the tuning was the fact that Bose doesn’t offer an equaliser. This is becoming more and more common, and the Parrot Ziks — which I’d call the closest competitor to the QC35s — have a great app—equaliser included. Bose does have an app, although it doesn’t offer much functionality at all. You can tweak some settings, like turning off the very robotic voice that tells you when you’re connected to a device. You can’t adjust the noise cancellation or access an equaliser, however. This isn’t a big deal, in the grander scheme of things. So we’ve talked about audio quality — very good, not perfect — and connectivity, which is refreshingly fantastic. That leaves build quality. Other Bose headphones I’ve tested felt like plastic, because they are made of plastic. The QC35s are no exception. However, I’ve come around to the lightweight approach. The headset feels light but not quite flimsy. I also like the way they fold up in a wonderfully portable way. If these headphones are aimed at travellers, the compact size is a godsend. For reference, the Parrot Ziks don’t fold and seem bulky in comparison. 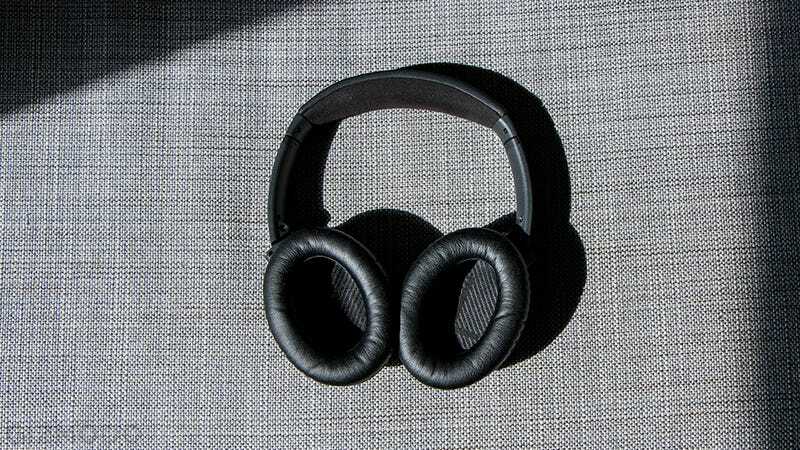 The cheaper JBL Everests do fold but offer inferior noise cancelling. The more expensive, also foldable Sennheiser Momentum Wireless are amazing in many ways, except they also cost almost 50 per cent more than the Bose QC35s. What should you buy? Well, as with many gadgets, it all depends on budget and taste. 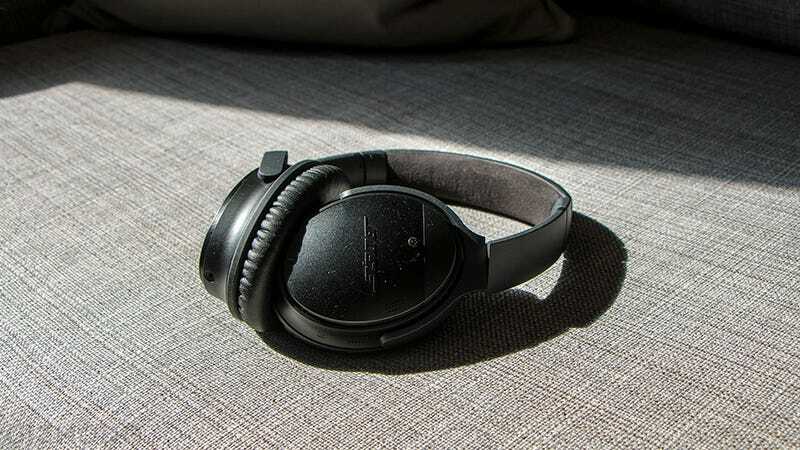 The QC35s offer superior noise cancellation, great connectivity, very satisfactory sound, and — as the name implies — quality comfort. They’re not cheap at £290, a price point not far off from the very flimsy Beats Studio Wireless. Although I doubt you’ll be disappointed, if you can afford it. It’s easy to put a price on high fidelity sound. But it’s hard to compete with blissful silence. The tuning isn’t super versatile, as the headphones can sound shrill or tinny at higher frequencies. It’s still good for most music.